Going through depression is hard enough on it’s own without the crushing guilt that comes along with potentially trashing your relationship. 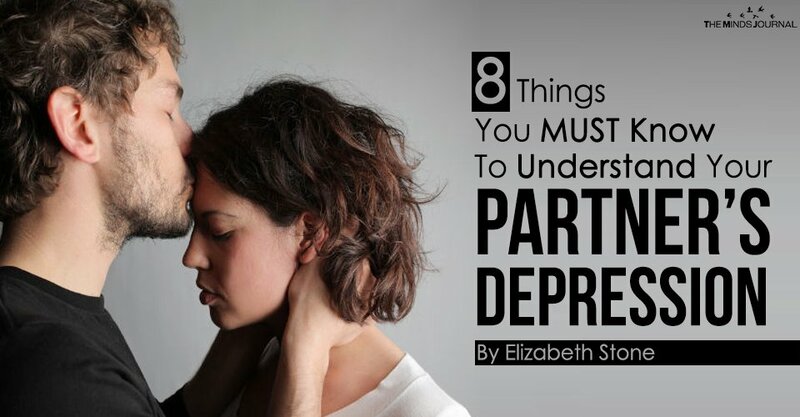 Combined with the fact that serious depression is difficult to comprehend without having actually experienced it yourself— it can lead to a perfect storm of relationship damaging behavior both from the person who is going through it and their partner who in an attempt to help, just can’t seem to do or say the right thing. So what do you do if your partner seems like they might be spiraling? 1. Recognize the signs of depression in the first place and consider if you or your loved one might be experiencing them. They might not come right out and say anything is wrong since most people don’t want to admit that it’s happening– even to themselves. 2. Be non-accusatory and consider your own attitude first. Understand that depression is not a choice, a moral failing or a personal affront to you. Repeat after me: depression is not a choice. It isn’t a ploy for attention or something that they’re “doing.” It’s an under-addressed, serious illness that affects every area of someone’s life. Our culture tends to treat it like a moral failing— like if sufferers would just “buck up” it would solve everything. This is wrong thinking and contributes to the epidemic of quiet desperation in our society. Because of this, there is a huge personal pride aspect to contend with. Usually it’s extremely difficult for sufferers to even admit that there is a problem— so don’t try to force anything. It’s not just “the blues,” it can come without warning, and it’s brutal. Trust. If you happen to think it’s “no big deal,” be prepared to STFU or get schooled on exactly how much more miserable you can make your lover. Take it seriously and avoid being flippant at all costs. 3. Don’t try to cheer them up or reason them out of it. If logical thinking was an anti-depressant, no one would be depressed. Don’t offer reasons why they shouldn’t be depressed. Your brilliant solutions will only serve to depress them further and disconnect them from your relationship. If they had the presence of mind to explain it to you– your partner WISHES it was as simple as implementing whatever solution you can come up with. They don’t want to brainstorm “ideas to fix it” either. For your relationship with them to have a chance at all, you have to leave therapy to actual therapists. The more you bumble around and try to save them or fix what they’re going through, the more they are likely to become angry with you, withdraw further and feel even more lonely and misunderstood. You will push them away if you do this, which is dangerous for them and your relationship. Elizabeth Stone is the founder of Attract The One. Her popular program&nbsp;&amp;lt;a href=&amp;quot;http://attracttheone.com/go/eafbio&amp;quot;&amp;gt;Ex Attraction Formula&amp;lt;/a&amp;gt;, has helped hundreds of women reunite with their men. She is thrilled to have helped so many people reignite the spark in their relationships. Tirelessly focused on helping people improve their love lives, her work has been featured on EHarmony Blog, YourTango, Thought Catalog, Mogul, Fox News Magazine, Ravishly, Femalista, Popsugar, Read Unwritten, Medium and many more.